PAUL CHESNE BAND: Crazy Girls Wednesday At 10pm. MSG Me For $5 Discount List! 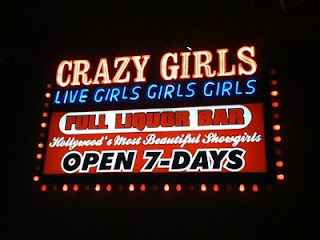 Crazy Girls Wednesday At 10pm. MSG Me For $5 Discount List! Crazy Girls. 1433 N. La Brea Ave. It's the one with the sign that says "Girls! Girls! Girls!" No one has to work on Thursday so this is what we in the business like to call a party. MSG me for $5 discount list otherwise it's 10 bucks. Here's a video of us playing live at the Redwood Bar & Grill on 12/5.